These quotes about faith are all non-denominational words of wisdom about believing in a 'higher power' whether you call it God, Great Spirit, or by any other name. Whether it's belonging to a particular traditional religion, following the guidance of any other spiritual practices, or using their own inner guidance, faith is a great comfort and guidance to many millions of people all over the world. 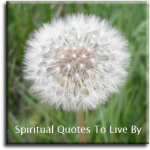 The quotes on this page are all from known sources, for more wise words there is also a page of Faith Sayings from unknown sources. It is impossible to see what you do not believe. Hope is... a waking dream. Faith is to believe what you do not yet see, the reward for this faith is to see what you believe. 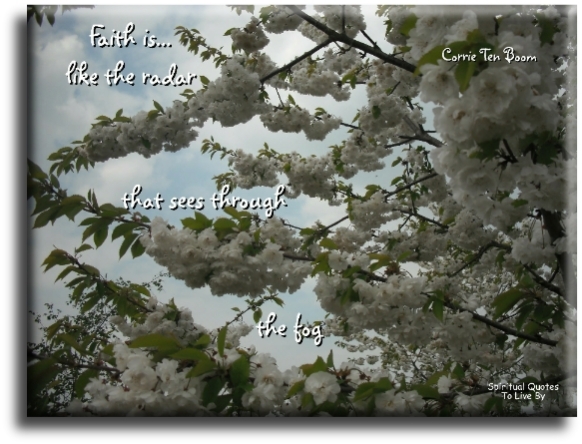 Faith is like the radar that sees through the fog. 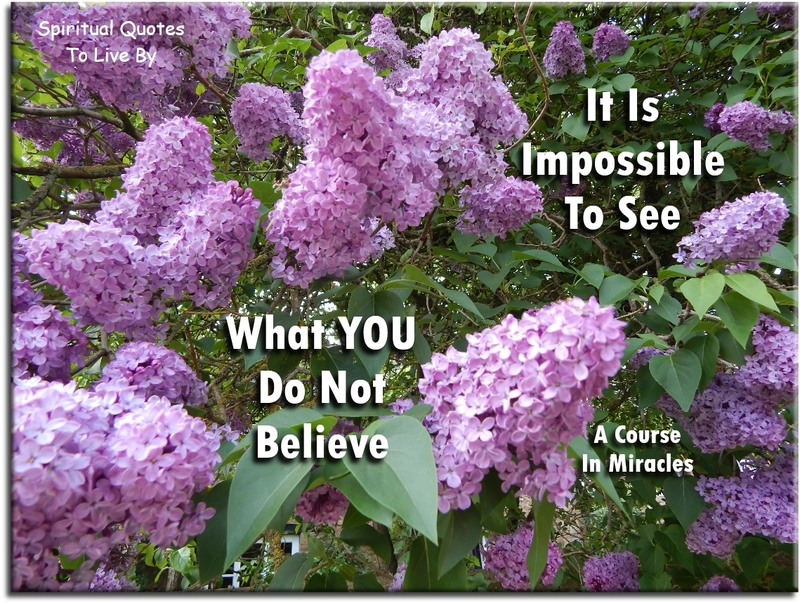 Belief and the feelings that we have about it are the language of miracles. As you reach for understanding, you find that your ladder of facts isn’t long enough, and you try to extend it by adding a rung of faith. Eventually you see that the task is hopeless, and you put away your ladder of facts and go get a ladder of faith. If you listed all the reasons for your faith and all the things that make you cry, it would essentially be the same list. 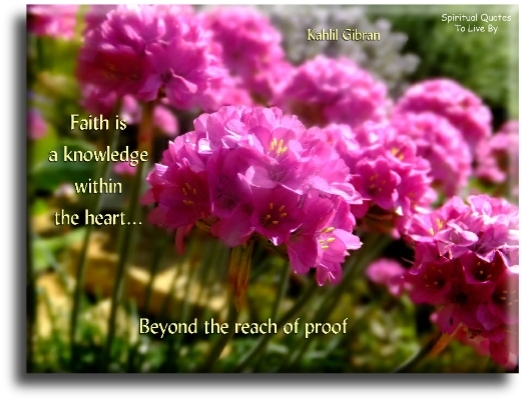 Of course I doubt, I do not practice a certainty - I practice a faith. Sometimes, as practise for trying to convince myself that God exists, I try to convince my shadow that the sun exists. Have faith that God won't send you anything you're incapable of handling. You can decide that the word fear is an acronym for... False Evidence Appearing Real. I paint not by sight, but by faith. Faith gives you sight. Faith is better than belief. Belief is when someone else does the thinking. God made truth with many doors, to welcome every believer who knocks on them. 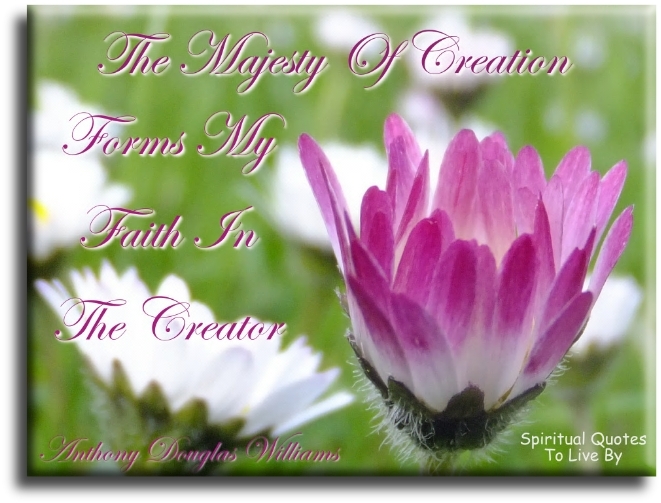 Have faith in your imaginal act. The law operates by faith. If you believe, no effort is necessary to see the fulfilment of your every desire. To effectively work these spiritual laws, you have to 'get it' deep down in your bones that the universe is bountiful and that, at all times, it has your back. You impact the field and draw from it according to your beliefs and expectations. What the mind believes, the body expresses. I believe we should remember the week-day, to keep it holy. I believe that sin is misdirected energy. I believe that there is no devil but Fear. I believe that no one can harm you but yourself. I believe in my own divinity - and yours. I believe that we are all sons of God, and that it doth not yet appear what we shall be. 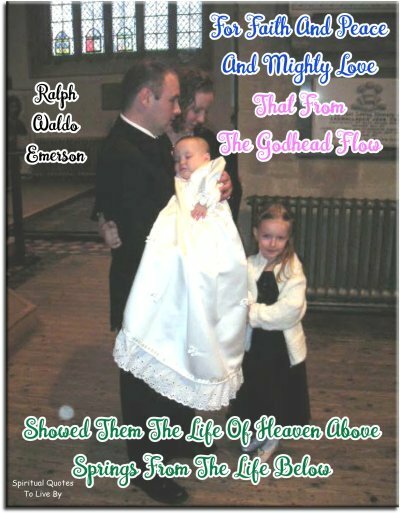 I believe that the only way we can reach the Kingdom of Heaven is to have the Kingdom of Heaven in our hearts. I believe in every man minding his own business, because I believe in freedom - social, economic, domestic, political, mental, spiritual. I believe in sunshine, fresh air, friendship, calm sleep, beautiful thoughts, because it is what we think and do that makes us what we are. I believe in the paradox of success through failure, that death is a manifestation of life and that the universe was planned for good. The rest, O God, is in Thy hand. Faith is nought else but a right understanding, with true belief and sure trust, of our Being: that we are in God, and God is in us: Whom we see not. 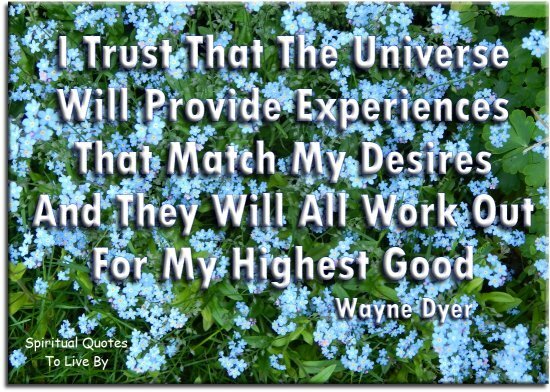 As you climb life's ladder take faith along with you, And great will be your happiness as your dearest dreams come true. 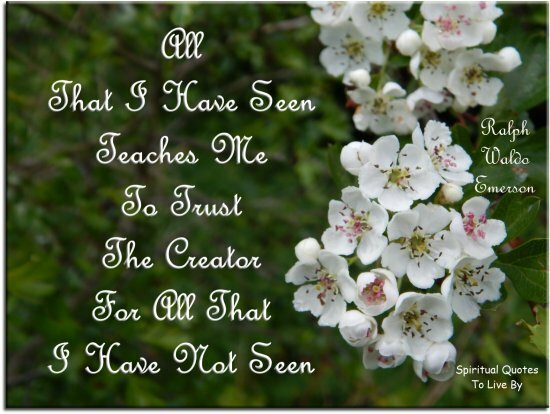 What better answers are there to prove His Holy Being, than the wonders all around us that are ours just for the seeing. Our ordinary mind always tries to persuade us that we are nothing but acorns and that our greatest happiness will be to become bigger, fatter, shinier acorns; but that is of interest only to pigs. 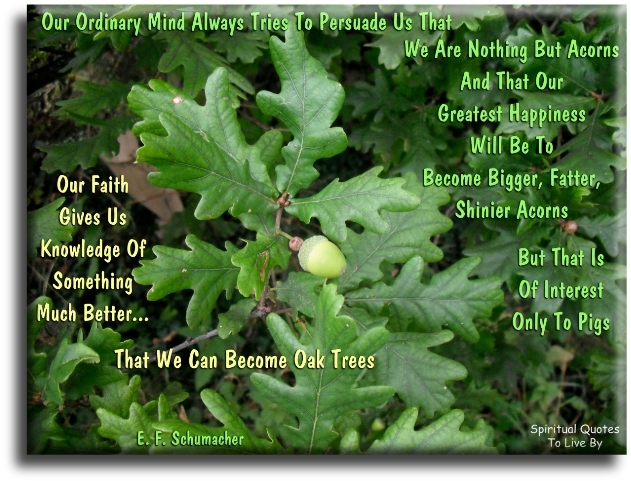 Our faith gives us knowledge of something much better; that we can become oak trees. The world is your best teacher. There is a lesson in everything. There is a lesson in each experience. Learn it and become wise. Every failure is a stepping stone to success. Every difficulty or disappointment is a trial of your faith. Every unpleasant incident or temptation is a test of your inner strength. Therefore, nil desperandum march forward hero. 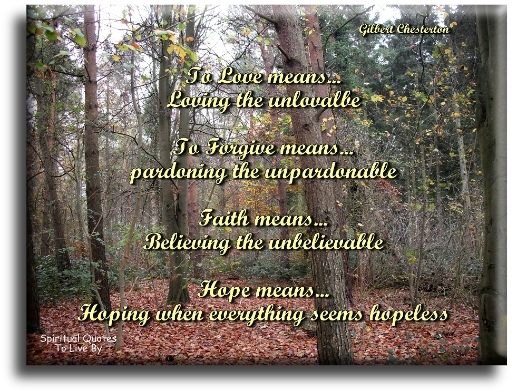 The power of belief... 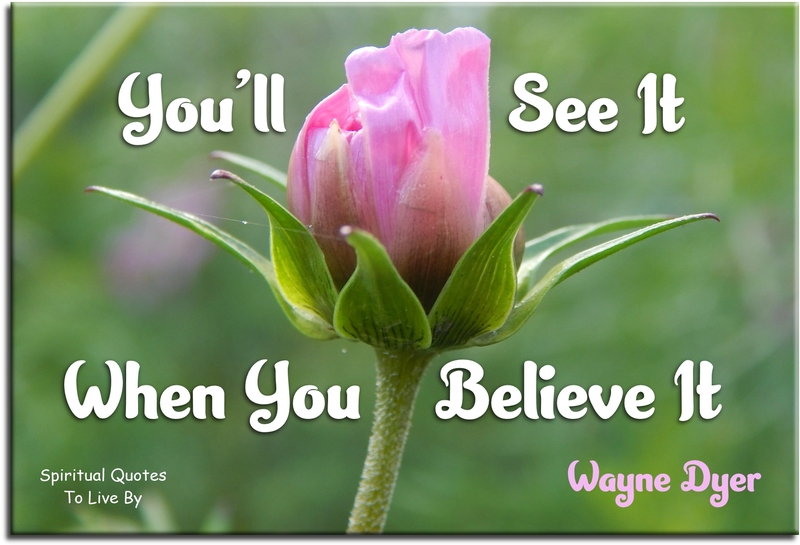 The absolute awesome, incredible power of belief, is the genie in your life. For those who believe... no proof is necessary. For those who don't believe... no proof is possible. If the thought ever comes to you that everything that you have thought about God is mistaken and that there is no God, do not be dismayed. It happens to many people. 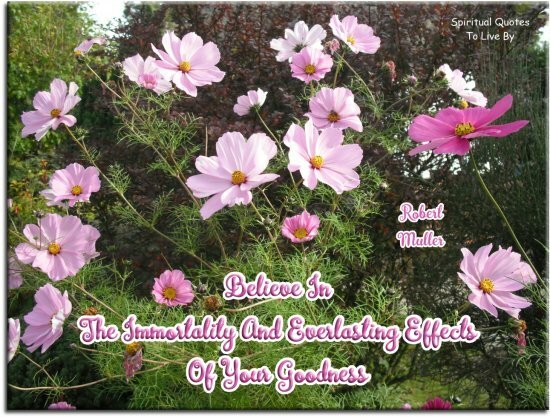 But do not think that the source of your unbelief is that there is no God. If you no longer believe in the God in whom you believed in before, this comes from the fact that there was something wrong with your belief, and you must strive to understand better that which you call God. 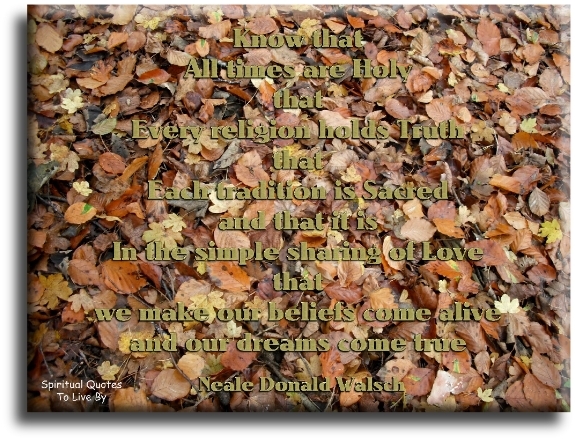 Know that all times are Holy, that every religion holds truth, that each tradition is sacred, and that it is in the simple sharing of love that we make our beliefs come alive, and our dreams come true. To have faith is to trust yourself to the water. When you swim you don’t grab hold of the water, because if you do you will sink and drown. Instead you relax and float. 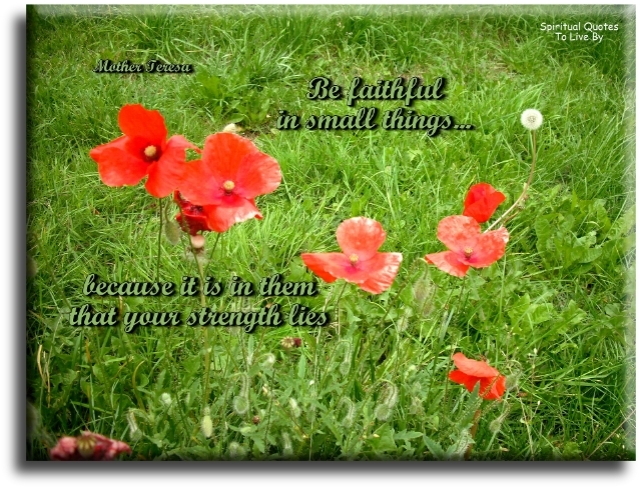 Faith is not so much something we believe... Faith is something we live.